Are you still Christmas shopping? I am! And I am working like crazy to get a few handmade gifts done in the next week too. 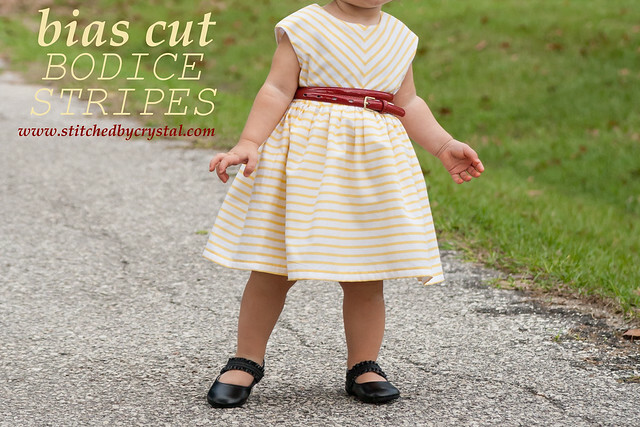 Today I have a quick easy project that would make a great gift for a little girl! My little E loves baby dolls, she is also very hard to shop for this year since she already has so many age appropriate toys handed down from her big brother. 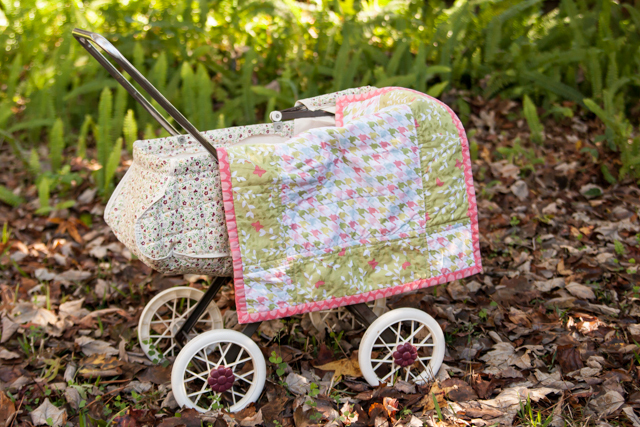 So I made her this sweet doll quilt that she can use in her baby stroller. The quilt is all machine sewn and only takes about an hour to make. The finished quilt measures 17" x 23" so it works for he tiny babies and stuffed animals now but will work well for those bigger 18" dolls too. 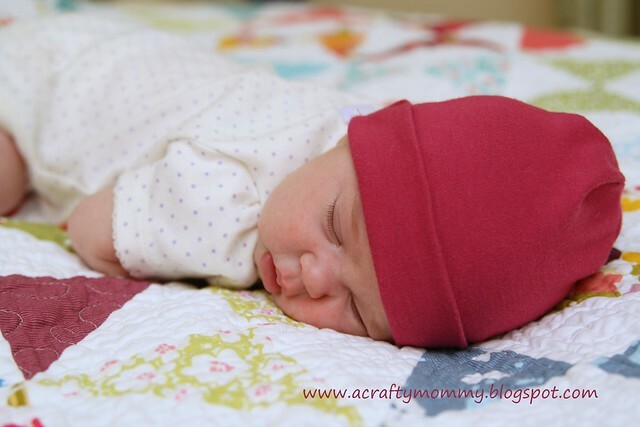 It is perfect for tucking her babies in at night. 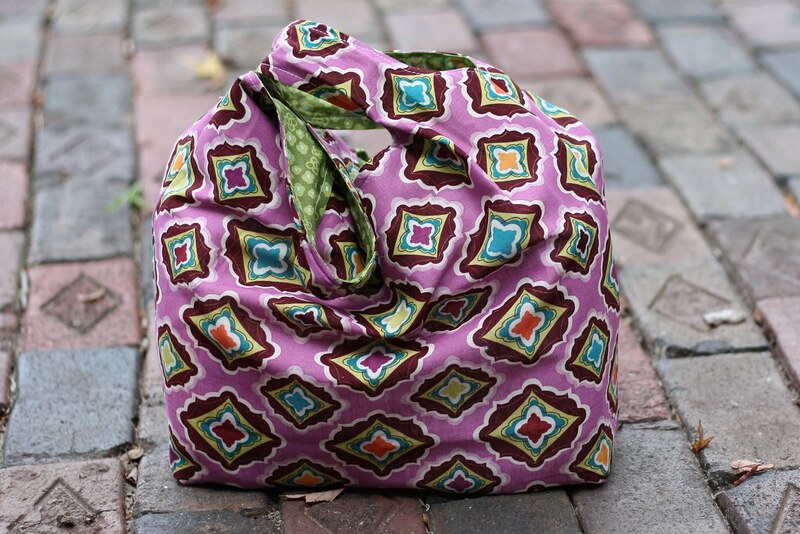 A sewing machine and an hour of time. 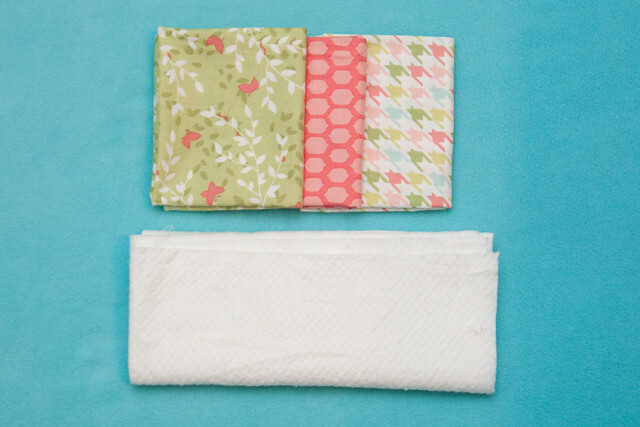 Start by cutting 4" strips off all 4 sides of one of your fat quarters. Repeat with a second fat quarter. 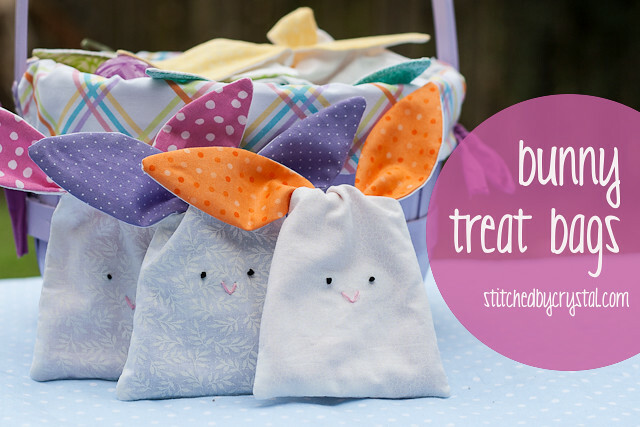 Swap the side pieces from one fat quarter with the other to create an alternating pattern. 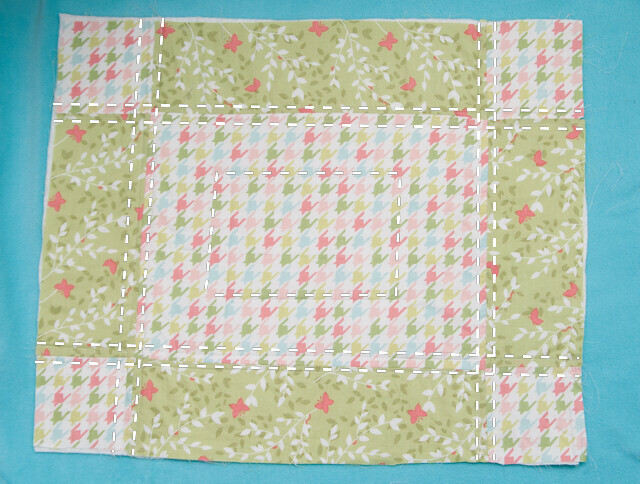 Sew the pieces first into strips using a 1/4" seam allowance, then sew the strips together to form the quilt front as shown below. Sandwich the quilt batting between the quilt front and back, I like to use a basting spray to keep everything in place while I quilt. Quilt the blanket by sewing through all three layers. I quilted along all the seams and then made a small rectangle in the middle but you can quit whatever you want. 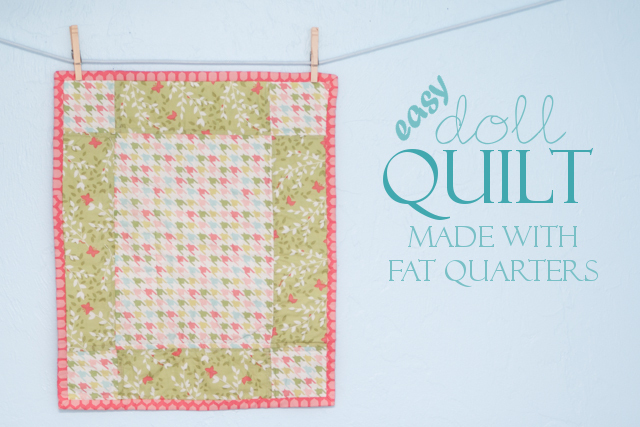 You can find more information on quilting HERE. Next we have to bind the quilt. Because the quilt is so small I chose to do a single binding instead of the double binding I use on bigger quilts. It is less bulky and lays nicer on the small quilt. 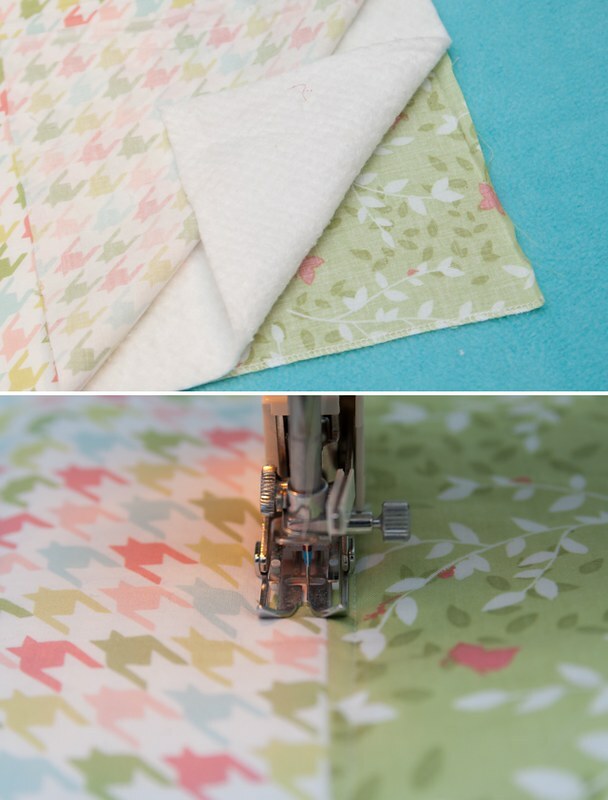 To make the binding, cut 4 strips that are 24" x 2¼" from the third fat quarter. 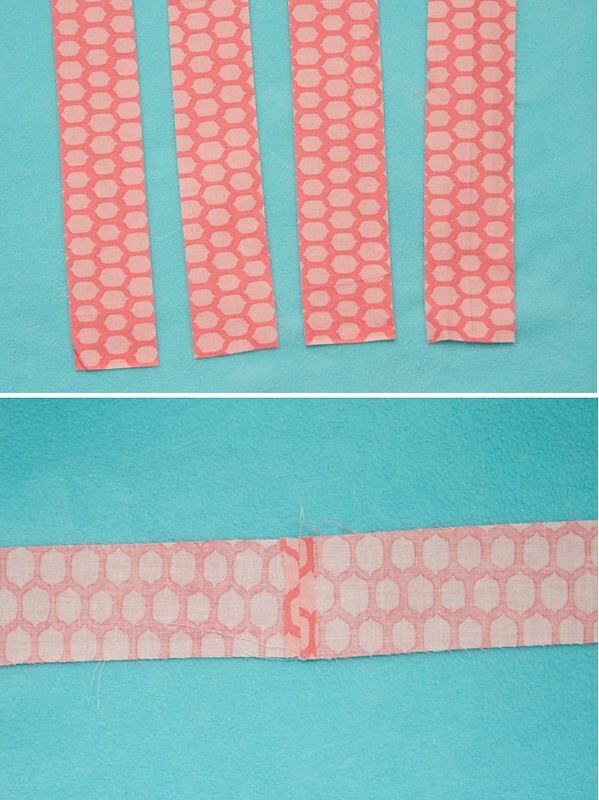 Sew the ends of the strips together to form one long strip and press the seams open. Starting somewhere in the middle of one of sides, line the edge of the binding up with the raw edge of the quilt. 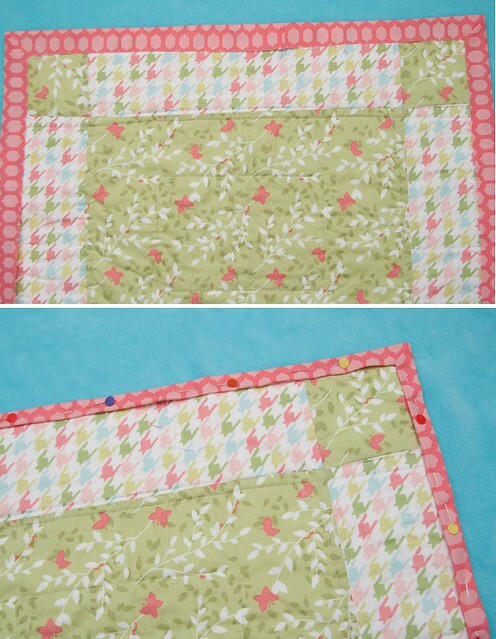 Begin sewing about 3" from the edge of the quilt and sew the binding with 1/2" seam allowance. 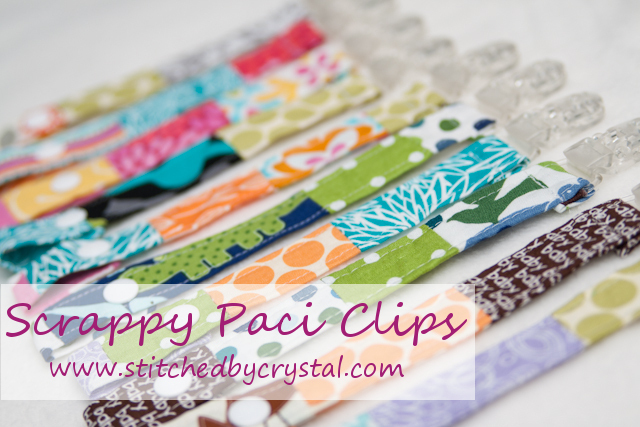 When you get to a corner, stop sewing about 1/2" from the edge of the quilt and backstitch. Flip the binding strip straight up and then bring it straight back down, lining the edge up with the next side of the quilt (see the pictures below). 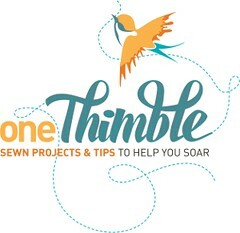 Begin sewing again at the very top edge. When you get back to the side where you started sewing the binding, stop sewing a couple inches from the end of your starting strip. Lay the binding strips flat so one is on top of the other. 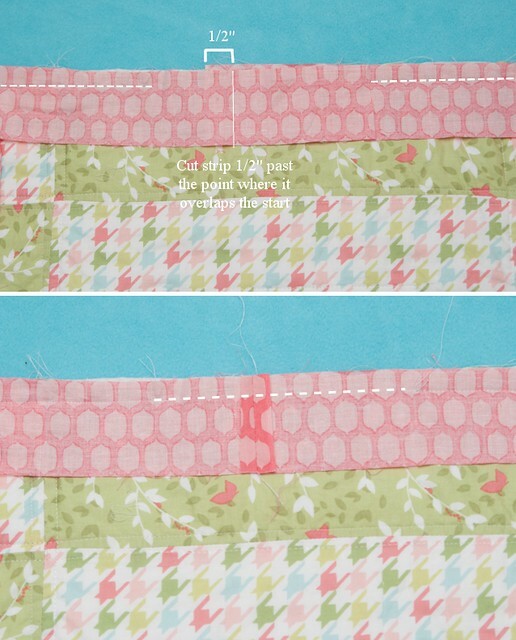 Cut off the extra binding by trimming the top strip 1/2" past where it overlaps your starting strip. Sew the 2 ends together with a 1/4" seam allowance and press the seam open, the strip should now lay flat along the edge. Finish sewing the binding to the edge of the quilt. Press the binding up and over the edge of the quilt. Tuck the raw edge under 1/2" and pin in place. 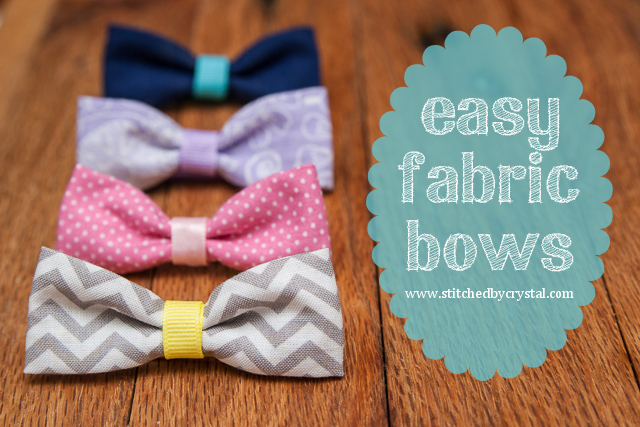 Sew the fold edge down either by machine or by hand. Hooray! 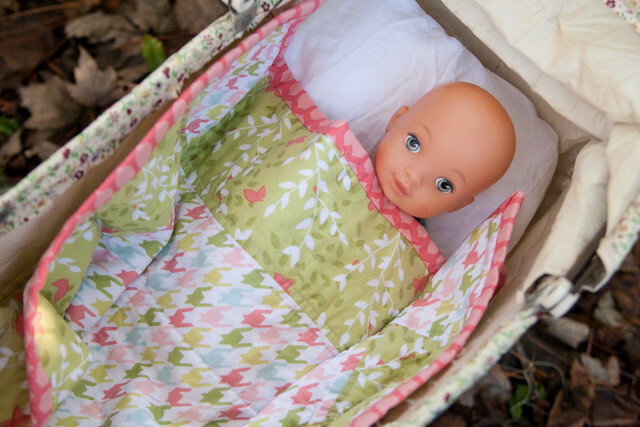 It's done and ready for snuggling baby dolls! 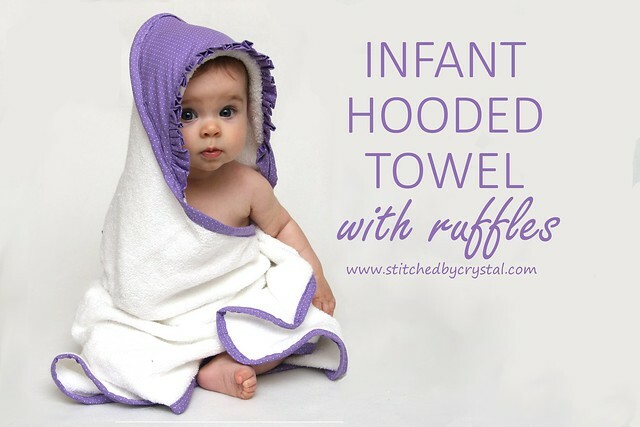 Need a doll to give with the blanket? 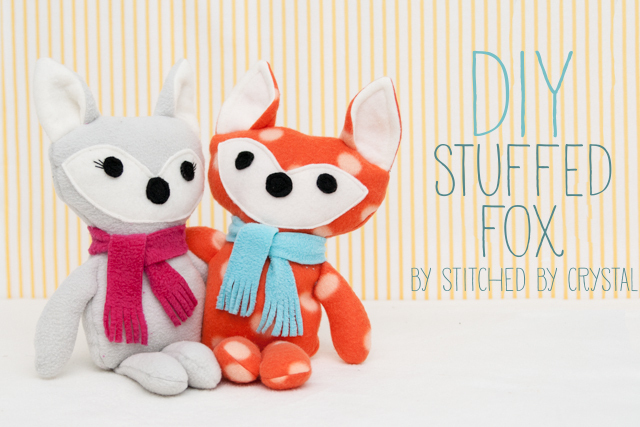 Download the pattern for this adorable stuffed fox HERE! 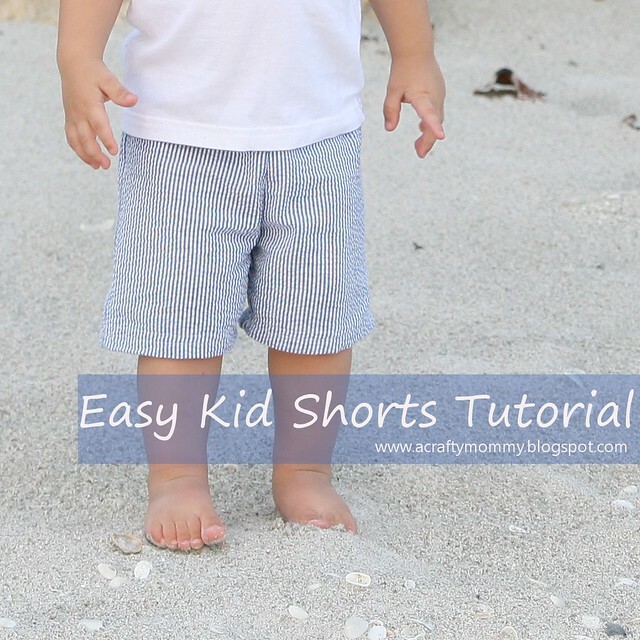 This blog is about a tutorial which is on different ideas. I think there should be some tutorial for the students who are workin g in essay help in australia projects. In this way students will get much information and they can do work on new ideas which are so good. Are you having a global idea that has been dominating your thoughts since day 1? You surely would love when SalseyVideo puts your idea in its Whiteboard explainer video.